Please note: After looking at the mechanics, I decided to remove Infravision from this list and add ESP. This is when things get muddied. ESP has a duration of 12 turns and a range of 6" which means that it should be a 3rd level spell. It does put a limitation on the range — the spell can be blocked. Thus, the base spell can optionally start with a 6" range if it can be blocked by a common element and a wall 3' wide and bigger; however, there doesn't seem to be a functional difference between ESP, Clairaudience and Clairvoyance. I am going to assume that ESP can only target one person at a time, whereas Clairaudience and Clairvoyance can target an area. This means that the base Detection spell is directional. Find Traps becomes the model for the area effect Detection spell — 3" radius. Wizard Eye increases the range of Clairvoyance x4 and introduces the idea of moving the focal point of the spell. Buying a 12" range (2 levels) with a +1/caster level puts the range at 19" when a Magic User (at 7th level) can first cast a 4th level spell, thus approximating the 24" range. The duration of 6 turns adds another level and assuming that the eye has a 3" field of vision gives us a 4th level spell. This leaves the idea of a mobile focal point in question; however, mechanically it is meaningless. Functionally, there is little difference between the way Clairvoyance and Wizard Eye function. In the end, the moving "eye" is a special effect rather than a game mechanic. Base Detection spell: Directionally detect a general characteristic or a specific object. Duration = instantaneous. Range = 1"/caster level or 6"+1"/caster level if spell will not work through a common element (i.e. lead) and cannot penetrate a wall 3' thick. 2nd level spell. Detect Trap. Duration = instantaneous. Range = 1"/caster level. 3"r area effect (one level). When examining these spells, I was struck by the mechanical description of Phantasmal Forces: "vivid" illusions of "nearly everything." There is no limitation upon which senses are engaged — rather we are allowed to imagine "nearly everything." This suggests that Invisibility means that the spell affects all of the senses. Given that higher level spells have area effects, the "nearly" qualifier on Phantasmal Forces must mean approximately the space occupied by one person. Duration for these spells is also interesting. They are almost all "permanent" until dispelled. Lower level spells are dispelled by touching them (or by attacking). Higher level spells may be interacted with without being dispelled. Range and Area Effect are also modifiers. Base Illusion Spell: Vivid illusion approximately the size of one person. Duration = concentration until touched for more complex illusions; Until dispelled or when the person affected by the illusion attacks for simple illusions (Invisibility, for example). No Range. Giving the spell Range = 24"
The illusion can physically interact with the world around it — any damage done will be according to the attack capabilities of the spell caster. 4th level spell. Illusion of a phobia inspired abomination. No Range. Permanent until dispelled up to 6 turns (one level). Can physically interact with environment and attack to do damage as per the spell caster (three levels). Going in, I thought this was going to be a bit boring, mechanically; however, upon a closer inspection, there is quite a bit of variation. The most intriguing for me is that CLW takes one turn to accomplish. Since other spells take effect immediately, this suggests a mechanic for instantaneous effect. Neutralize Poison seems to be more of a preventative spell, rather than a curative — cast it on someone about to trigger a trap so as to counter whatever poison is there. Thus, the duration of 1 turn and cannot save someone who has already failed a save or die roll. Raise Dead suggests a ranged mechanic for healing spells; however, this means that "curing" death is a 4th level spell. Thus, I will require an additional modifier when "cure death" is used, insuring that it will always be a 5th level spell. Finally, it is of interest that Remove Curse is available to Magic Users at one spell level higher. *These are available to Magic Users; however Cure Curse requires 2 levels instead of 1. 3rd level spell. Cure 1d6+1 hp (one level), Ranged (one level), takes effect immediately (one level). On Thursday, I posted some thoughts on 'Everybody Draw Mohammed Day.' While most folks reacted to my comparison of Mohammed to Christ, I did try to make a subtle point about the OSR. Based on those very same reactions, it appears to have been largely missed. One of the reasons I love this hobby has nothing to do with the games we play. I play because of the people at the table, or, in the case of our little corner of the internet, the people behind the blogs. Although we are quite a diverse bunch who tend to like to argue a lot and can occasionally get rather snarky, I largely find that people who populate the OSR to be very decent human beings — despite our great diversity of opinions, backgrounds, interests, etc. In some ways (regardless of whether we espouse to be or not) we behave in a rather Christian-like manner. We freely give away much of our hard work and help support each other by buying what we do have to sell — even when we can get some of it for free. When one of us asks for help, it is almost certain someone will answer the call. Thus, when one of us writes about the games we play, we generally don't expect someone to tell us that what we have written should not even be said. For example, "You like the Thief class? You shouldn't say such things in polite society!" is not something I expect to see (outside of an poor attempt at sarcasm). Yet, whenever I venture into theology, apologetics or some other challenging aspect of religion, I am routinely criticized for doing so. Rather than wrestling with what I've said, I'm criticized for the act of saying it. Essentially: Gasp! How dare you speak of such things! Mind you, I take no offense. 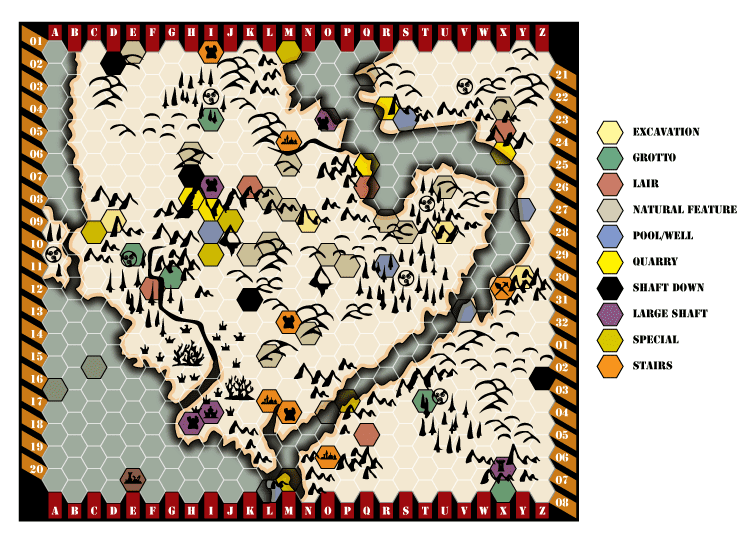 As I've said from the very beginning of this blog I am very aware the worlds of Christian Theology and RPGs are definitely not seen as compatible by a good chunk of people out there. My hope has always been to reduce that number and to explore just how creative both Christian Theology and RPGs can be. However, Thursday got me to thinking about this apparent disconnect between on the one hand the way the OSR is able to so deftly handle the great diversity that exists out here when it comes to RPGs and on the other hand the way it can try to shut down things outside of RPGs (note that even Jeff, who was largely trying to stay away from religion and politics, got directly and passively criticized for bringing up 'Everybody Draw Mohammed Day' in the first place). 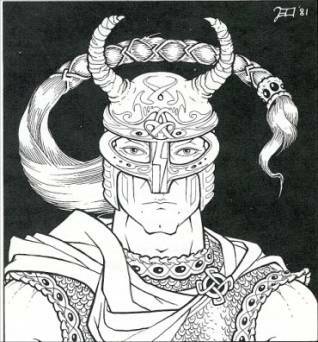 Now, maybe I'm not deeply involved enough in the OSR to see this kind of thing more often, but it still makes me wonder. I'm pretty confident the violent fundamentalist Muslim nutjobs don't speak for all of Islam in the same way that the Westboro Baptist Church doesn't represent the mainstream of Christian thought. Personally, I'm more in favor of converting Christian extremists to Islam. Islam already teaches that Jesus was the Messiah; what more are they going to get from Christians? I'd like to take some time with this topic because not only is it important, but I believe it is relevant to the OSR. Many (if not all) of us have spent hours pouring over older editions of all sorts of RPGs. We have done so for a variety of reasons from creating retro-clones, to creating new RPGs based on older rule sets, to actually playing these older games, to using them as an inspiration for playing newer games. 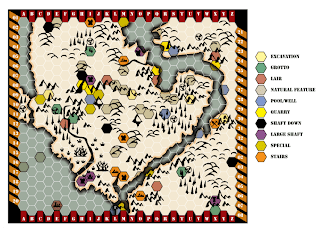 There are plenty of examples of OSR bloggers who have deconstructed the evolution of rules in an attempt to figure out which incarnation works best for them (see my current attempt to mess around with OD&D magic, for example). The key here, is that without a close examination of these original documents, the OSR would not exist. The statements above by both Jeff and JB run counter to this fundamental truth about how we do our hobby. I have long read, enjoyed and respected both Jeff and JB so what I am trying to say is not meant to insult, diminish or dismiss either of these two. In fact, my respect for them is the very reason I am writing this post. Statements like those made above demonstrate that those who have made them have not gone to the source material and spent time to understand them. I'm sure everyone of us can find examples of statements made by our fellow gamers about any edition of D&D which demonstrates that they have not taken the time to understand why people like to play different editions or even to read the rules of those editions. Even I am guilty of making assumptions about 4th edition without ever having sat down to read those rules. Mohammed condones lying in three instances: war, reconciling people and husband to wife. Mohammed was involved in slavery and slave trade. He would use his profits to purchase warhorses and weaponry in order to wage war. Mohammed coercively forced conversion and prayer. Christ is both God and Man, of one essence with both the Father and the Spirit. Christ asked us to love one another — even our enemies. Christ sacrificed Himself for our salvation. If we accept that Mohammed and Christ are the prime examples of what it means to be human and what our behavior as human beings ought to be to their respective followers, than it should be relatively obvious that warfare and the mistreatment of human beings (especially women) are legitimate expressions of Islam. Whereas they are foreign to a proper expression of Christianity. To answer Jeff's comment, what we have deemed as "radical" in Islam is actually able to stand on very firm theological ground. Whereas there are peace-loving Muslims, there is no such thing as a peaceful version of Islam. To answer JB's comment, Islam understands Jesus to be a prophet, but denies the crucifixion, the resurrection and His divinity. Whereas Islam insists that Allah is a distant transcendental being who is completely separate from his creation, Christianity insists that God Himself loves us so much that He took on our humanity, died with it, resurrected it and ascended with it into heaven so that we might be able to share in His very being and His eternity. What does someone gain from converting to Christianity? God Himself. Like James over at Grognardia, the death of metal vocalist Ronnie James Dio has reminded me of all the friends that I had who were metal heads that I also role-played with. I never much got into their music, but (due to their their enthusiastic willingness to share) metal became an integral part of our RPG "soundtrack". In fact, when I contemplate the music we listened to during and around my early role-playing days, I am amazed by how eclectic it is. 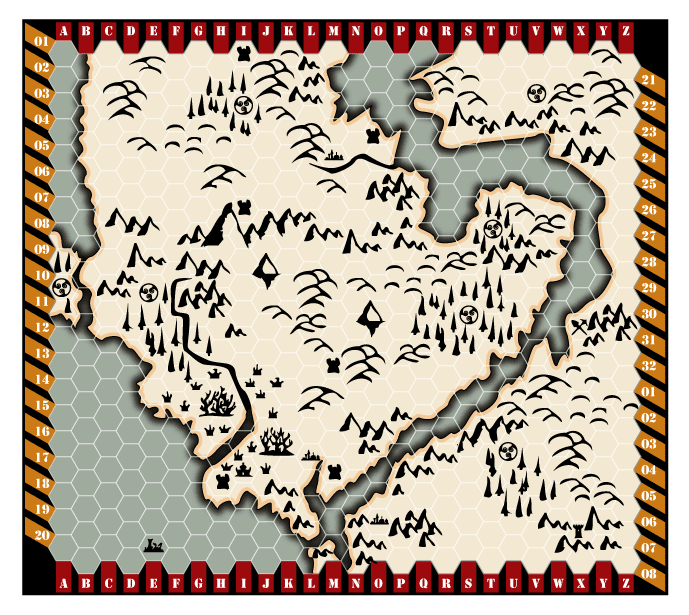 Beyond a common culture (as James calls it), my role-playing expanded my own cultural experience. Each one of my friends brought something unique to the table and we all learned to appreciate (if not love) all of it. Prog rock, punk, new age, classical, electronic as well as metal all meshed to create an inspirational backdrop for our game-sessions. Believe it or not, this is what Christianity has done with each of the cultures that it has encountered throughout the ages. 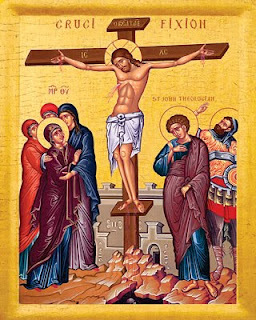 It allowed each culture to find its own unique way to express the fundamental Christian truth of Jesus Christ crucified and risen. What we know today as Christian Tradition is an amalgam of different cultural expressions throughout the ages. In a way, this is also what I have found (and love) in the OSR — a willingness to accept a huge variety of influences and interests that affect and enhance our beloved hobby. Its not just a shared culture, but an expansion of it. Examining these mechanics there are two anomalies. The first is that there are two different durations for Protection from Evil. As I see it, there are two ways to deal with this. One would ignore it and have the base duration be 6 turns. The other way would be to have clerics get a boost with duration, but take a penalty with area effect. Neither is a perfect solution; however, the former is simpler, so I will use it. The other is that the base duration for Haste/Slow is 3 turns (as opposed to 6 & 12); however, the area affect of these spells is 6x12" which translates as 60 ft x 120 ft! Since this is exponentially larger than 10'r. (thus difficult to quantify) and a remnant from Chainmail (thus intended to affect whole units of battlefield troops) I am going to ignore both the 3 turns and reduce the area effect to 10'r. It does suggest a future consideration of spell level reducers; however, that very likely would produce more min/maxing than I am comfortable with. Therefore, the base Bluff Spell affects a specific group/attack (i.e. evil), has no range and has a duration of 6 turns. 3rd Level Spell. Duration 6 turns. No Range. Immunity to normal fire attacks (two levels) and +2 saves vs. magic fire (one level). Note: There are Anti-Clerics (listed below) who have similar powers to Clerics.Those Clerical spells underlined on the table for Cleric Spells have a reverse effect, all others functioning as noted. Note that the only level title that does not get the designation "evil" is the Shaman — an explicitly pagan title. It seems to me that (beyond the already largely Christian level titles and spells) that this is the strongest evidence I have found to suggest that the original conception of the Cleric class was of a pseudo-Christian. I've started to expand my Reading List over at the right to acknowledge all those folks I pay attention to and have bothered to read my blog. Forgive me for not doing it sooner and forgive me if it takes me a while to wade through the wonderful multitude that is now out there writing and reading about this hobby I love. What follows is a rough draft for categorizing all of the spells that exist in OD&D according to Men & Magic. The spell level is listed after the spell name with Magic Users spells in ( ) and Cleric Spells in [ ]. I am assuming that shorter lists will be easier to break down mechanically, so some of these lists (Change Environment, for example) may have to be revised. Comments and suggestions are welcome. I asked a question the other day as to whether or not anyone had tried to break down the OD&D spell list into quantified mechanics ala Champions superpowers. I did this because I have been contemplating doing exactly that, but didn't want to duplicate any work already done (it is a rather daunting task, especially with some of the higher level spells). Thanks to all those who answered, but it seems that if someone has done such a thing, those who read this blog don't know about it. I'm interested for a couple of reasons. It allows a lot of freedom for players — when special effects are up to player creativity, it can expand the idea of 'what is magic' in ways that D&D has never conceived. It also makes magic adaptable to all kinds of genres and settings. The first step in this process is to come up with a list of categories that describe the various spells in OD&D, regardless of spell level. For example, both sleep and hold person incapacitate their targets. The next step is to break down the various mechanics of these spells to determine what mechanical variables each category has and how many spell levels each mechanic is worth. Since both spells are 3rd level, each mechanic costs one level. In the case of area effect and ranged , it is easy to construe what a spell would look like sans these mechanics: a target of one creature and a touch attack. The damage, however, requires some interpretation. Since damage is linked to the spell caster's level, I am going to assume that a lower damage slot ought to as well. Thus, a lower damage level could be 1d4/level or 1d6+level. At lower levels 1d4 is not worth wasting a spell on and at higher levels, it will always average above 60% of the damage done by 1d6/level. In my opinion, this is too powerful. On the other hand, 1d6+level is a good hardy spell at lower levels and at high levels starts to average around 30% of what 1d6/level does. This seems to me a good balance. The beauty of this, to my mind, is that we are not limited to the special effects of existing spells. The three spells above could be anything we want to imagine: the three above could just as easily be called Arrow of St. Sebastian, the Hand of the Necromancer, and the Aura of Pain. Unfortunately, not all of the mechanics of OD&D spells are this easy to dissect. Hopefully, I'll have more to share in the future. In the wake of the news that Frank Frazetta has died, I found myself surfing the web in search of his work. In some sense, I was trying to remind myself in what way his work has had influence on my life, my person and my gaming. I was very quickly reminded that overall, I have never been much of a fan. When gazing upon one of his paintings, there is often something in the back of my head that tells me I shouldn't be looking at this. His style has always struck me as too visceral. Note how visceral and realistic the first is — even grotesque, especially when compared to the stylization of the second. The first, while being able to capture the utter human tragedy of the crucifixion, fails at capturing what St. John calls Christ's glorification. The second, while not nearly as realistic, manages to capture both the human tragedy and the glory. In the end, I have a hard time looking at the first, whereas I love to gaze upon the second. For much the same reasons above, I love to look at Otis' piece and have a hard time looking at Frazetta's. Although Otis' style is highly unrealistic, it evokes a sense of heroism even in the face of tragedy and death (see his covers for Moldvay's Basic Edition and the new Hackmaster Basic). This is where I must insert a very big however. 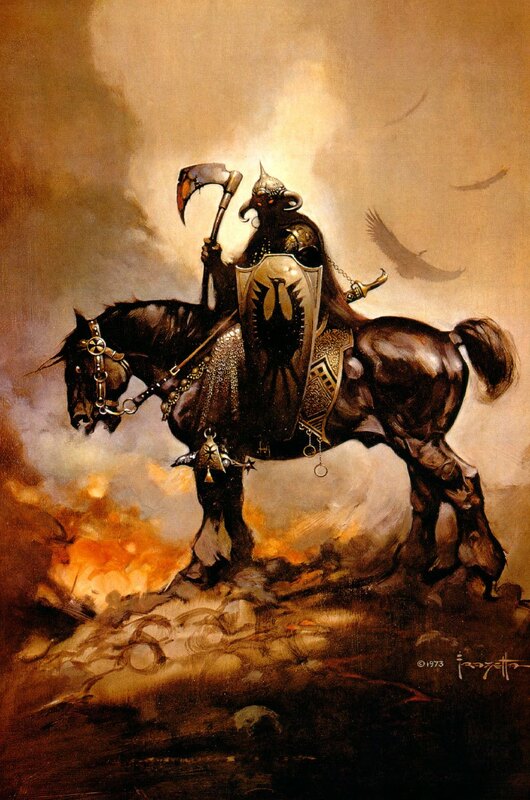 Although I am not a big fan, I must give credit where credit is due and must admit that Frazetta has indeed affected my life, my person and my gaming. Death Dealer forces me to come face to face with evil. There is nothing at all heroic about Death Dealer — he is violence incarnate. The fact that he is faceless reminds us that he dwells within each of us. He is a mirror that reveals that evil must be laid at the foot of humanity. We have brought it into the world and we keep it alive everyday by the choices we make. Indeed, the most frightening monsters in the world and in fantasy are not dragons, demons, or even the mind-shattering horrors of HPL's imaginations. The most horrifying monsters are humans. In his own way, Frazetta helped me see and understand this reality and set me on a path to seek an answer to evil in the world — to seek out the heroism in Otis' work and the glory of God in the icon of the crucifixion. To that end: thanks Frank. You will be missed. O04 Mt. Ore — Floating mountain chained to the earth by duergar to make it stationary so that they can mine it. Forests can only exist where there is water, so there had to be either a river or a spring; however, I didn't want to have very many rivers (to emphasize importance of springs and wells). Thus, I only included two. I placed springs roughly based upon where they exist in Anglesey. Floating mountains are wandering monster encounters — they ride the wind patterns and are constantly moving. Some follow more erratic patterns than others. The two floating mountains on the map are the only two that are stationary. 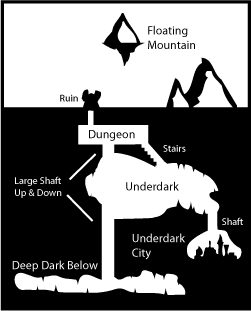 One has been chained down in order to mine it, the other is stationary due to some unknown reason (note that it lies between to "specials" in the underworld beneath). Ruins (which I gave the greatest chance, because I thought it cool and CDD#4 has a table on ruins that I wanted to use). Misc. (determined by another CDD#4 table on dungeons). The monsters listed at these locations in brackets indicate the main occupant or the "master" of the dungeon beneath. Elves and dwarves are known as ylfe and duergar. Both races are descended from Nephilim. As such, there is no distinction between "wood" and "dark" elves or "mountain" and "grey" dwarves. Neither are particularly trustworthy or happy about humans being on the island. The current wave of humans are Afonites (followers of Afon(eos) and the revelation of God as Triad). They originally lived east of the island in the most north-western part of a world-spanning Afonite Empire. A massive invasion by pagan barbarians and humanoids collapsed the western half of the Empire, cutting off the colonies of the north-west. In the face of the invaders, the Afonites fled west, finally arriving at the island. They had nowhere else to flee and things looked bleak; however, following the martyrdom of the Four Martyrs and the miracles surrounding their death, the Afonites pushed the invaders off the island under the leadership of St. Morol. Thus, everything east of the channel is occupied by pagan barbarians and humanoids (save for the Monastery of the Hidden Spring). West of the channel is wilderness with pockets of Afonite civilization. I've been meditating on spells in OD&D and the way Champions handles superpowers. The latter focused on mechanics and assigned a point value to each mechanic. Special effects — how those mechanics actually looked like in the game world — was entirely up to the player. Is there anyone or anywhere that tried to do this with a D&D spell list? The other day, a priest friend of mine, knowing of my passing interest in all things Welsh, gave to me an article about the Holy Wells of Wales. Something that many of us forget is that Britain was conquered by the Romans in A.D. 41 and was Christian very early on. St. Aristobulus, one of the 70 Apostles and mentioned by Paul in Romans 16:10, went to Britain and became its first bishop. When the Church gathered at the First Ecumenical Council at Nicea in 325, bishops from Britain were in attendance. When Rome abandoned its colonies in the 5th century, pagan Goths invaded the island and drove the Christians west into modern day Wales and Cornwall. In Wales, it being a mountainous country, water supply was an acute problem. Thus, wells and springs have been central to both the pagan and Christian inhabitants (see the resting place of Excalibur, for example). When the Christians arrived, these wells and springs came to be associated with various saints and some were even supposed to have healing properties. This struck me because I have been meditating upon the Scriptural metaphor of God as a fountain, as understood by St. Athanasius, and its potential for use in an RPG fantasy setting. Athanasius was at that First Ecumenical Council at the beginning of the fourth century and spent his life defending that council and the position that God the Father, God the Son and God the Holy Spirit are of one essence. In defending this position in a letter to his friend Serapion, he points out that the Father is equated to a fountain (Jer 2;13; Bar 3:12). In turn the Son is called a river (Psalm 65:10) and we are told that we drink of the Holy Spirit (1Cor 12:13). This metaphor accomplishes two things. 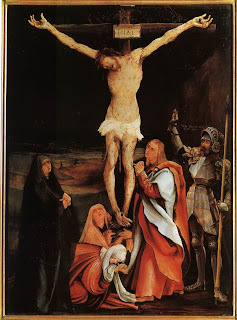 Firstly, it gives us a working image to help us understand the Trinity. All three elements make up a functioning fountain — the fountain, the flow of water, and the ability to drink of it. Although these elements are distinct, they are also all a working fountain and it is impossible to conceive of a working fountain without one or more of these three. It is a practical way of understanding the dogmatic formula "One Godhead in Three Persons." Secondly, it demonstrates that we are to participate in the Trinity. We drink of the Holy Spirit, which brings us into contact with the Son through whom we may do the will of the Father. This, ultimately, is the entire purpose of the Incarnation, Crucifixion, Resurrection and Ascension — to make it possible for us to drink of the Holy Spirit. This conception of the Trinity is wonderfully suggestive. They imply the "crucifixion" of Afon(oes) would be by drowning with the delectable divine irony of the River of Life dying in a river. Temples would be centered around living water — springs and rivers. There would be the liturgical action of blessing and drinking this living water. Initiation would by immersion in living water. In addition, these names are derived from Welsh — which dovetails beautifully into the concept of Holy Wells of Wales. Thus, when deciding on geography for my map, I naturally looked to Wales — specifically where one can find Holy Wells. There are several in the NW part of Wales, especially on and around the island of Angelsey. Considering how interesting it looks, I decided that it would be the basis for my map. Thus, via an article on the Holy Wells of Wales and St. Athanasius the Great and his Letter to Serapion on the Holy Spirit, I've come to having a good outline and sketch of the geography, the history, the culture and the religion of this fantasy setting. You'll notice I was moved to add one more layer up top. I've always liked the image of floating mountains, and it seemed apropos to add some. It allows for a kind of symmetry — the farther up or down an adventurer dares to go, the more dangerous life gets. While I was watching TV this evening with my family, we were bombarded with images from the most recent version of the tale of Robin Hood. In turn, this reminded me of a tasty little historical tidbit that puts me at odds with the famous bandit from Sherwood Forest. Robin Hood fought against King John. In several renditions of the story, the bandit remains loyal to King Richard, John's Brother. A quick look at history reveals that King John became king anyway, after Richard died. He then got into a political battle of wills with Rome over the appointment of the Archbishop of Canterbury. When John was forced to back down, his barons gathered together and forced their king to sign a little piece of paper that stated no man is above the law and became the foundation upon which the United States is built. It was the Magna Carta. Eventually I will see the newest version of Robin Hood, but I will always be grateful to King John and part of me will root for the villain. Without him wearing the crown, I don't get to be who I am today. 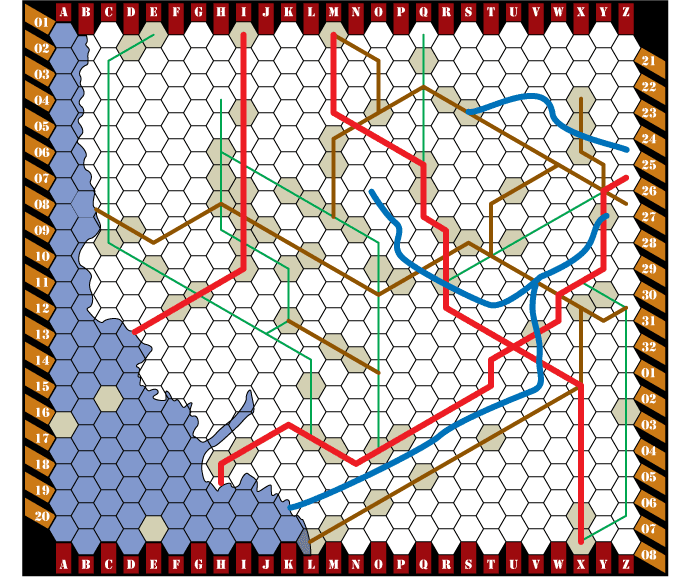 Red lines are primary caverns. Brown lines are secondary caverns. 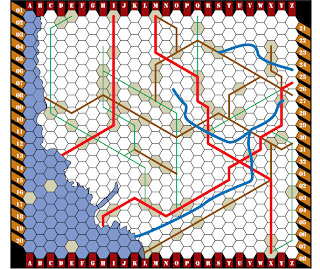 Green lines are tertiary caverns. Blue lines are underground rivers. Everything here should be self-explanatory. The monsters in parenthesis have set up permanent camp in the areas they are listed with. I am inclined to understand "Special" to indicate areas either infected with pure chaos, have pocket plane access and/or are crash sites for alien starships from an ancient battle. From here I'll work up.